Minimal spices and clean flavors are the key factors that make today’s dish an all time favorite in our home. 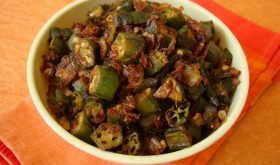 Okra aka Bhindi aka Bendakaya is a much cherished Indian vegetable in our home and we enjoy it in all its avatars. A few days ago, I made an Okra fry to go with rotis. Its a slightly different version of the okra fry recipe I blogged earlier. 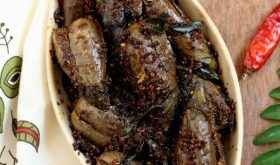 I tend to go back to this Andhra style okra fry recipe often because of its simplicity and tantalizing flavors. The tempering ingredients along with the roasting of the okra yield an incredible flavor. Do try this Indian vegetable recipe which makes for a delectable side with rice and sambar or pappu pulusu and rotis. Left overs make a delicious filling for a sandwich. Wash the okra, dry them, chop tip and tail ends. Chop into 1/2" pieces. Heat oil in a cooking vessel. Once the oil is hot, reduce heat to medium flame, add the mustard seeds, let them splutter, add the cumin seeds and let them brown. Add the curry leaves, dry red chilies and garlic cloves, stir them for few seconds. Add the chopped onions and saute till transparent. Add the okra and turmeric pwd and combine. Saute on medium high heat for 3-4 minutes. Reduce to low flame, add a tbsp of yogurt or lemon juice (to reduce slime) and let it cook for 4-5 mts. Saute in between so that they don't burn. Reduce flame and cook till the okra turns soft. This could take about 15-20 mts of slow roasting. Season with salt and turn off flame. Serve hot with steamed rice or rotis. If using asafoetida in place of garlic, add it along with curry leaves and red chilies. You can add roasted peanuts as a final garnish for variation. By Sailu Published: April 24, 2012 Minimal spices and clean flavors are the key factors that make today's dish an all time favorite in our home. 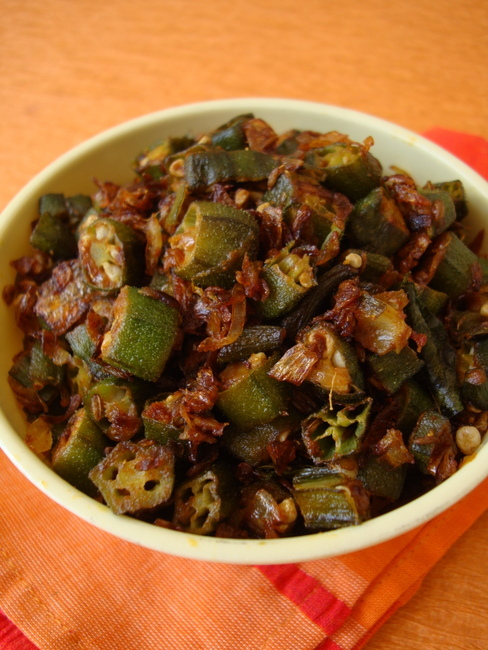 Okra aka Bhindi is a much cherished Indian vegetable in our home and we enjoy it in all its avatars. A few days ago, I made an Okra fry to go with rotis. Mmmm… Delicious… Lovely side dish for dhal rice! 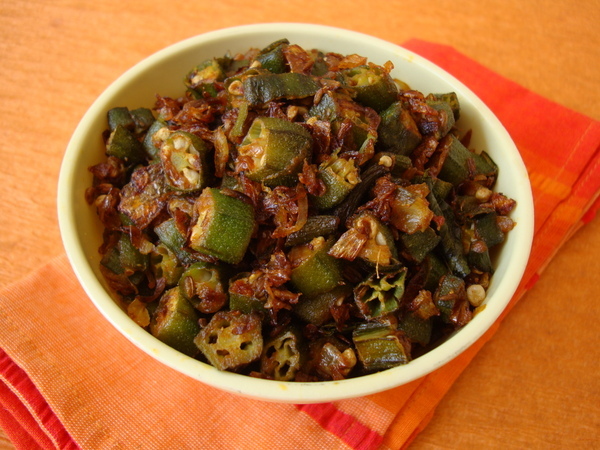 I,ve tried ur okra fry….it turned out very gud..my hubby liked it…gr8 work..
ur pics are mouth watering 🙂 with authentic andhra style…keep doing this with some more gr8 recipies for all of us…. very nice.. came out good.. 🙂 Thanks. This one too is good. enjoyed the flavor. I am more confused when to put salt, after putting onions in the pan or at the end. Will the salt doesn’t allow the any vegetable to fry? Made this turned out great. Thanks …! Can i use frozen cut okra for this recipe ?